The later known Nordic kingdoms or ‘nations’ had not yet been developed during the Vendel age. Scandinavia was inhabited by numerous North Germanic tribes and clans who were almost in constant war with each other. Even the sub-tribes and clans of the larger tribes were politically independent from each other, constantly fighting one another. It seems that at times powerful warlords appeared establishing ephemeral principalities or kingdoms. 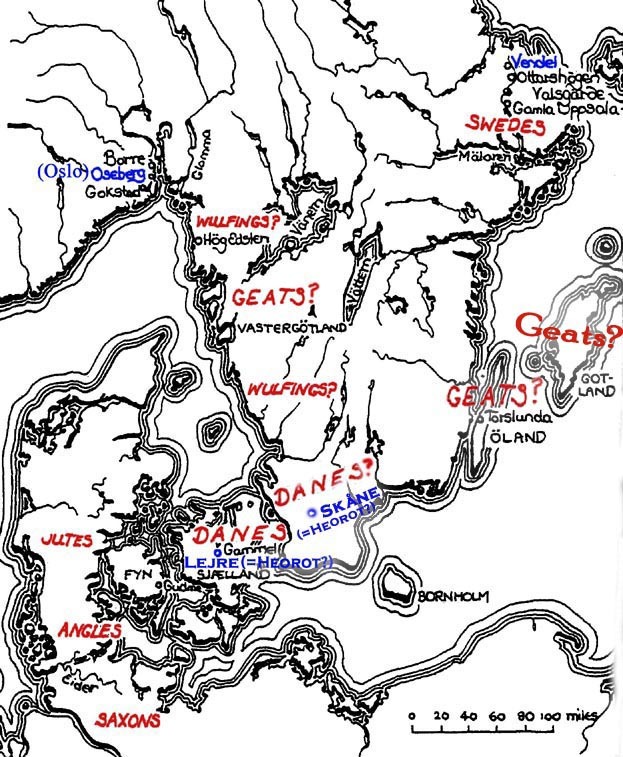 This is the time and the societies described in the Anglo-Saxon epic poem Beowulf, an epic possibly of Jute or Gott/Gotar origins (see part II). 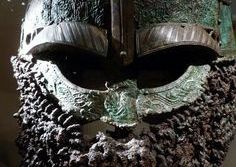 The burials in the Vendel cemeteries contained rich weaponry from which the renowned helmets excavated there stand out. In this series of articles we present a collection of images of the original helmets and a series of modern reconstructions of them. 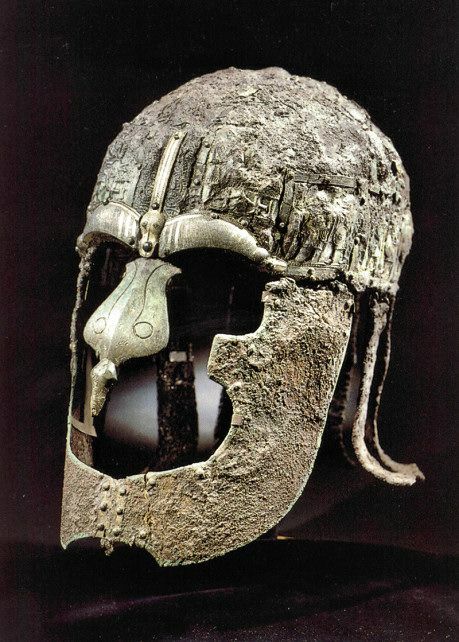 We include the Sutton Hoo helmet in this presentation because several researchers consider the Sutton Hoo burial as a part of the Vendel general cultural conglomerate. 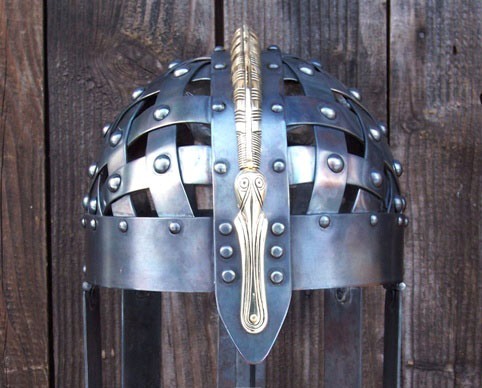 Reconstruction of the helmet from the Ulltuna cemetery by Thorkil (copyright: Thorkil). Map of Vendel period eastern and southern Scandinavia. The tribes noted are the ones mentioned mainly in Beowulf. The main archaeological sites are also noted, including Vendel, Valsgärde and Old (Gamla) Uppsala in Uppland (top right). Helmet found in the Valsgärde cemetery. 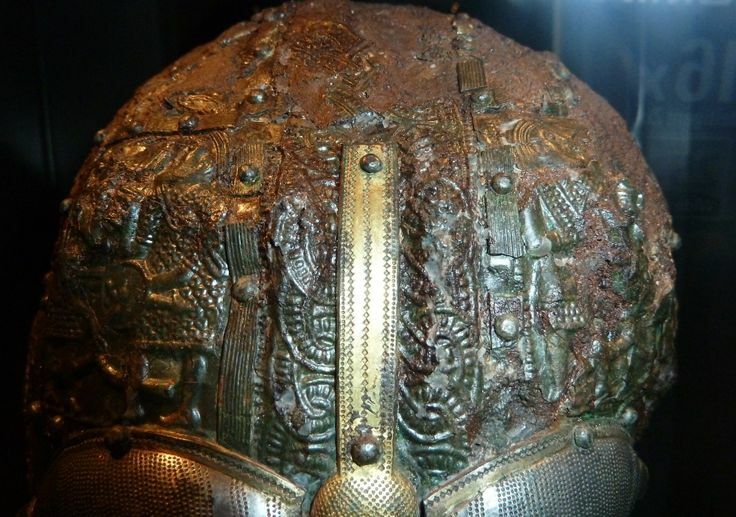 Detail of another helmet found at Valsgärde. 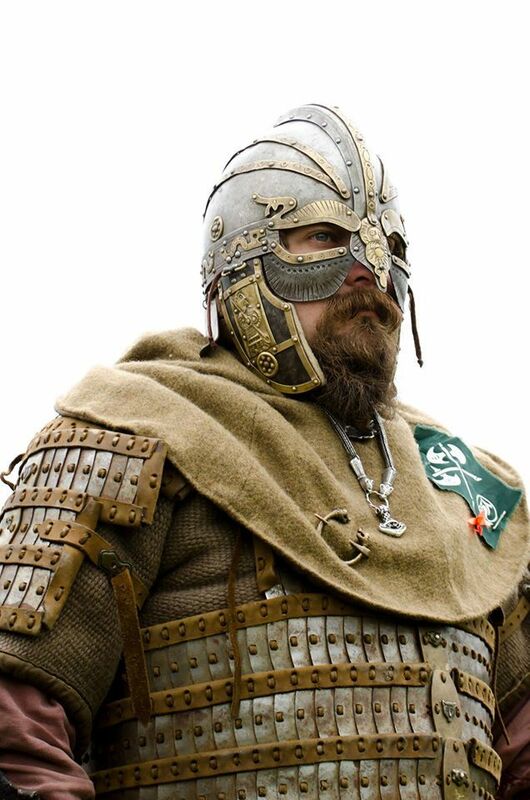 A reenactment of a Nordic warrior wearing a reconstructed Vendel type helmet. Note the lamellar armor, an influence on the Scandinavian weaponry by the steppe peoples (Sarmatians, Alans and Huns) via the continental Germanics. 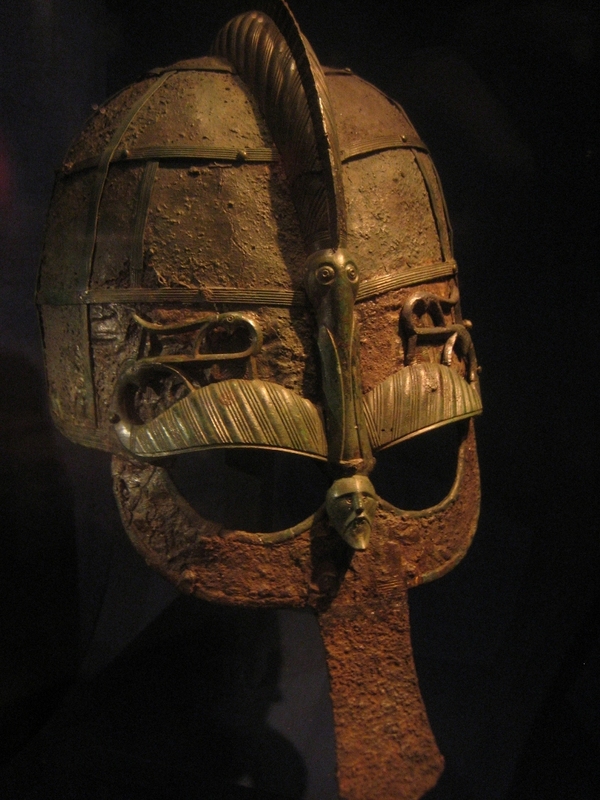 The Vendel helmets had also design influences from the nomadic peoples. 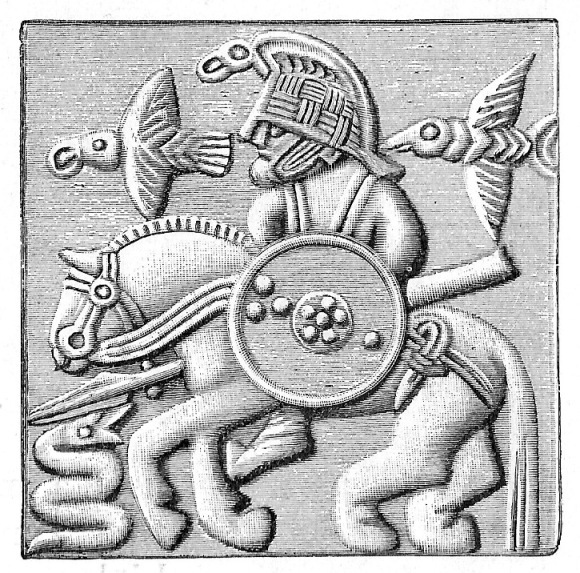 A Scandinavian horseman in an ornamental plate of the Vendel period, wearing a helmet of the homonym type. Note the crest of the helmet in the form of a raven. 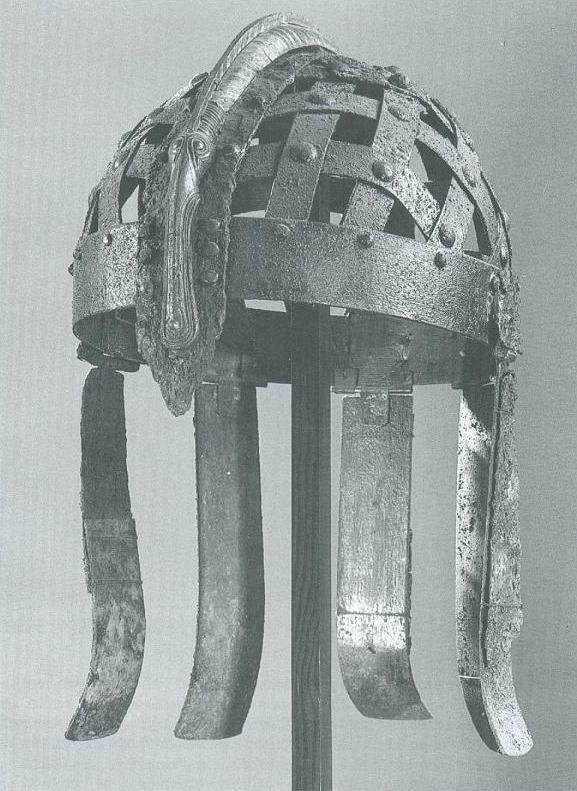 Helmet found at Vendel, grave I, 7th century. 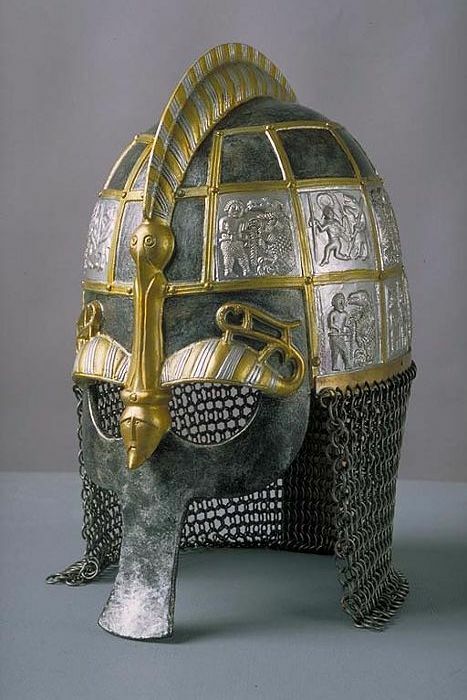 A fine reconstruction of a helmet found at Vendel, grave I. Detail of the skull of a Valsgärde helmet. 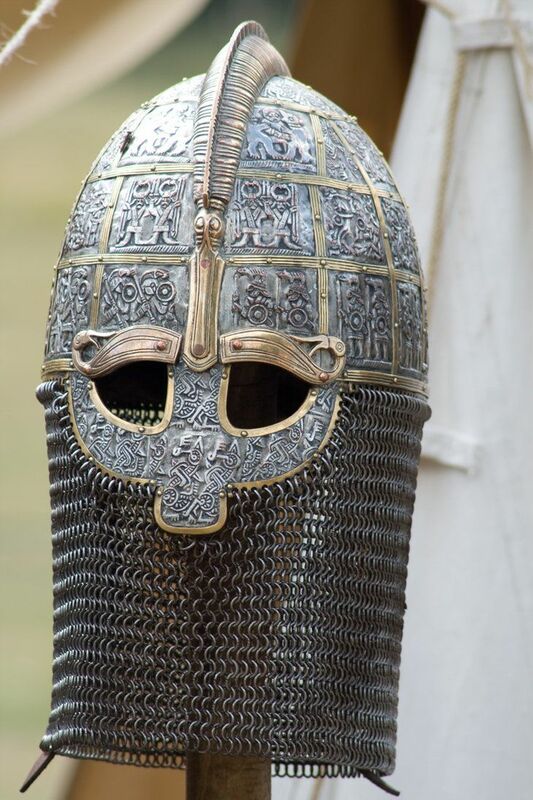 (I’m sorry for not mentioning all the reconstructors, reenactors or owners of the reconstructed and reproduced helmets in this series of articles but I neither know them nor have the needed time to find them. If someone knows who they are, please inform me but only by reference to the official site or other reliable source. Thank you in advance). 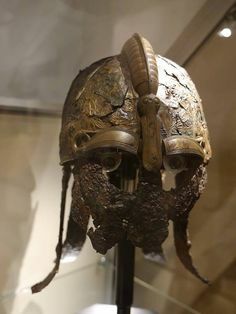 In the second and third part I will present more pictures of helmets and I shall deal in more detail with the tribes and the clans of Sweden, Denmark and Norway during the Vendel period. Germanic tribes and slavic tribes were wearing lamela armor way before huns or any nomadic person was.